For companies tackling digital transformation, it’s become necessary to do more testing during the development phase. Mobile app development teams know that testing early and often is key to achieving digital quality and faster release cycles. Yet “shifting left” is hard work. 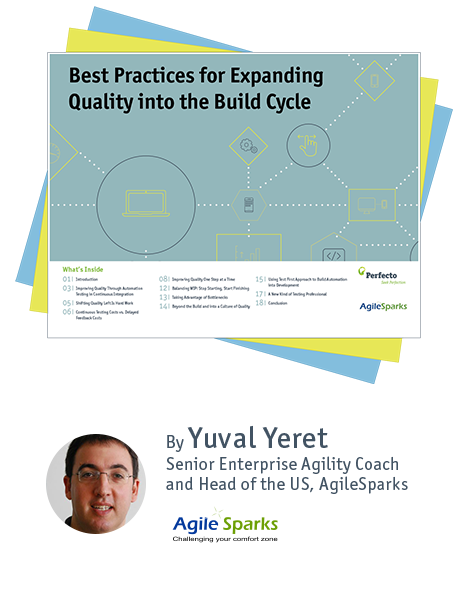 In this eBook, Best Practices for Expanding Quality into the Build Cycle, Perfecto and AgileSparks offer expert advice on what it takes to “shift left.” Complete the form below to get this must-have eBook today! How to use continuous integration and test automation to move digital quality into builds. Measuring the costs and impact of delayed feedback to app developers. Instilling a “Test First” approach so you can create a culture based on continuous quality.